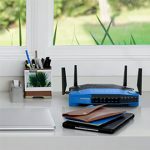 Since its emergence in 2005, Open Mesh has evolved quite a bit and, while before it only manufactured access points (it is one of the first companies to port the mesh technology to the consumer market at an affordable price), it seems that now, it has expanded its reach, adding a series of Ethernet switches to its portfolio. I knew it was only a mater of time until we got to see the first cloud-managed Open Mesh switches after the manufacturer implemented the capability to manage and monitor network switches into their cloud-controller CloudTrax, so we can now choose between 8-port PoE+ switches (S8-L or S8), 24-port PoE+ switches (S24-L and S24) and a 48-port PoE+ switch (S48). 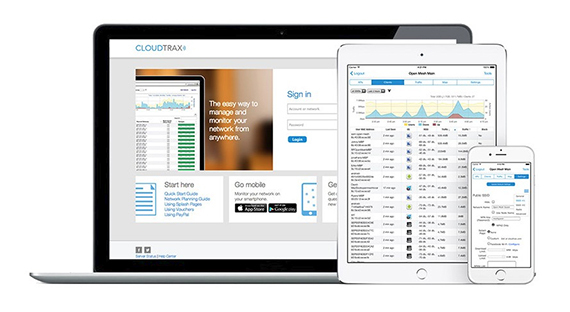 If you’re unfamiliar with CloudTrax, know that it is a cloud-based network controller which offers the ability to create wireless networks, as well as the possibility of managing or monitoring them from anywhere in the world and just to name a few of the advantages of a cloud-controller, there’s the unlimited number of devices that it can handle (an on-site controller is always limited to a certain number of devices) and the flexibility of a remote management (you are no longer bound to on-site management, so it becomes incredibly easy to monitor multiple networks scattered all around the world – you need a strong and reliable Internet connection). That being said, the device that I’m going to focus on is the 8-port PoE+ cloud-managed Open Mesh S8 switch (special thanks to Open Mesh for providing a review sample), which should nicely complement a network of PoE devices (access points, cameras). 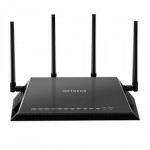 The Open Mesh S8 follows the same design blueprint that has been adopted by pretty much all Ethernet switches on the market, featuring a rectangular metallic case, which is covered by a black matte finish (it won’t retain any fingerprints, if you need to move the device a lot) and, similarly to the large majority of enterprise-focused products, the practical side of the device is valued a lot more than its looks (and this is not a bad thing since it will most likely end up in a server cabinet, anyway). 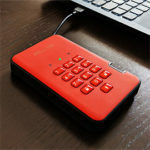 Furthermore, the case of the Open Mesh S8 is reasonably compact for a PoE+ switch, measuring 13 x 9 x 1.7 inches (PoE switches tend to be bulkier) and the device is also quite lightweight, weighing only 4.48 lbs. 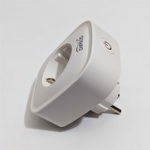 Note: Some of the few switches that defy the traditional rectangular design are the Netgear S8000 (which, as you may expect, is not really targeted at businesses, but it’s being marketed as a gaming and streaming switch) and the Ubiquiti TOUGHSwitch TS-8-PRO (which is also a consumer-oriented device), both of these switches lacking the rack-mounting option (which is vital in an office). 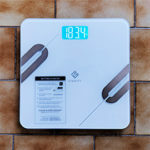 The Open Mesh S8 can be positioned flat on a desk or a shelf (you need to attach the four feet, so you won’t scratch the bottom side of the switch), but, if you lack the necessary space, you could use the two brackets (included in the package) and either mount the device on the wall, with the ports pointing upwards or you could mount the switch in an EIA standard size 19-inch rack (it will take one rack unit). On the left and right side of the switch, you can see cut-out patterns which ensure that the case remains at a reasonable temperature while functioning, but, since the S8 does not rely only on passive cooling, there is a small fan on the rear side of the switch which runs all the time (while the device is connected to a power source). The fan is surprisingly quiet (I could barely hear it even during the night), so, even if you decide to keep it on the desk, it won’t create any inconveniences. The front side of the switch (which is also made of metal) is the most important part of the S8 since it is home to almost all the ports and LED indicators: from the left, there’s a RJ45 Console Port (which is an RS-232 serial interface that can be used to connect the S8 to a computer, in order to start a terminal application (and, for example, use command-line interfaces (CLI)) – you need to use a rollover cable), the Power LED (will shine a solid green light during the normal operation of the switch), the Fault LED (if the LED turn on, then there is an error in the system), the PoE Max LED (if the LED indicator is turned off, you can still add more PoE devices to the switch, otherwise, if the LED turns on, then you have exceeded the maximum PoE limit – which is 150W, while it’s S8-L sibling, features a maximum of only 55W), the LAN Mode LED, the PoE Mode LED, the LED Mode button (switches between the LAN Mode and PoE Mode) and a small recessed Reset button (used to return the device to factory default settings). 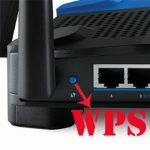 Further to the right, there are two blocks of four 10/100/1000Mbps Ethernet ports each, which can be used to connect your PoE devices (the switch supports IEEE 802.3at/af and every port has an output of up to 30 W). 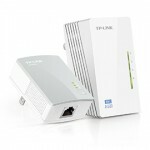 Each of the eight ports comes with its own set of two LED lights, one indicating the Mode (solid amber indicates that there is a 10/100 Mbps link established on the port, while a solid green light indicates a 1000 Mbps link) and the other, the Link/Act (if it is solid green, then there is a valid link established on the port, while a blinking light indicates the transmission of packets on the specific port). 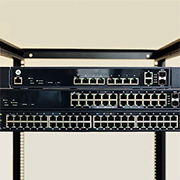 On the right side of the second block of ports there are two Gigabit Ethernet ports aligned vertically, which do not support the IEEE 802.3at/af PoE standard (each with its own set of two LED lights – Speed and Link/Act). Lastly, there are two 100/1000Mbps SFP uplink ports (the SFP modules are not included – you can use generic ones), which are a nice addition if you plan on taking advantage of high-speed fibre uplink or connect two switches together and gaining a higher bandwidth. 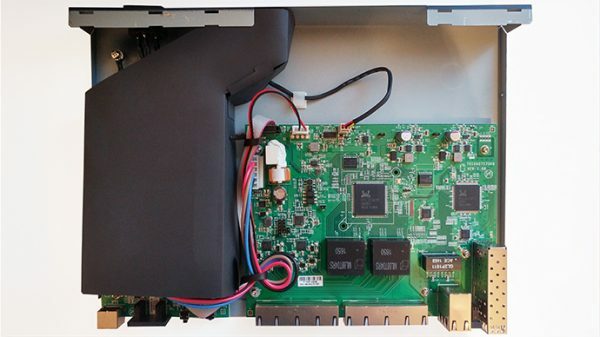 On the rear side of the switch, there is a label with the MAC address (needed to add the switch to the CloudTrax controller) and the Serial Number, four cut-outs for the fan and the power adapter (100-200VAC, 50-60Hz, 2.5A – the power supply is internal). 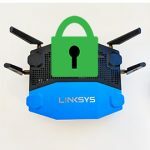 Note: Inside the package, you can find the Open Mesh S8 PoE+ switch, a Power cord, the four feet, the mounting brackets with the necessary screws and a small Quick Start Guide. Inside the case, the Open Mesh S8 is equipped with a Realtek RTL8380M G9K98E4 10/100/1000M switch controller, a Realtek RTL8214FC GCF53P1 PHY chip, 256 MB DDR3L SDRAM clocked at 800MHz (Nanya1632 NT5CC256M8IN-DI), 32MB of flash memory, a 32F100 MCU, two Broadcom BCM59111KMLG Switch Controllers, two RTL8231 GBC6482 GG50 LED display controllers and two ML88T04RS 1650 transistors. This way, the S8 cloud-managed switch features a switching capacity of 24 Gbps. The hardware installation of the Open Mesh S8 is very simple: take the unit out of the box, choose a spot for it on your desk (you can also mount it on the wall or in a rack using the provided brackets), use the power cord to connect to a power source (the switch lacks an On/Off button), use an Ethernet cable to connect to a router to gain access to the Internet (so any configuration made into CloudTrax can be applied to the S8) and, from here on, you can add as many devices as you want, the only limiting factors being the number of ports (you can daisy chain multiple switches) and the maximum PoE budget. 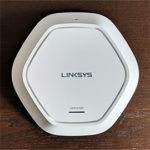 Since this is a Layer 2 switch, it has to be connected to a router, because it needs a DHCP acquired IP address (it does not have NAT/DHCP capabilities), so you shouldn’t connect it directly to the modem. After the hardware installation is done, you need to create a new network using the CloudTrax controller, so you can add, monitor and configure your switch and any other device you want to connect to the new network (you can make the necessary configurations prior to actually installing the switch, you just need the MAC address of the device – and that’s the beauty of a cloud-managed switch). 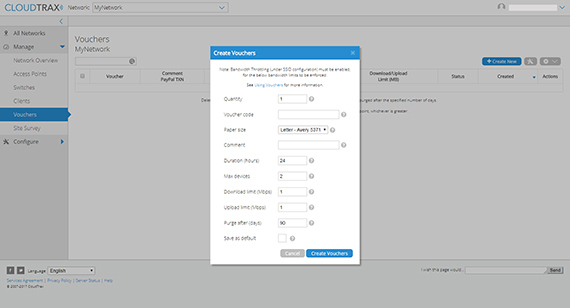 So, the first thing you need to do is sign up on cloudtrax.com (the service is free), log into the user interface and you’ll be greeted by the All Networks page, where you get to either Create a new Network Group or Create a Network (you also get the option of exporting all into a CSV or XML format). 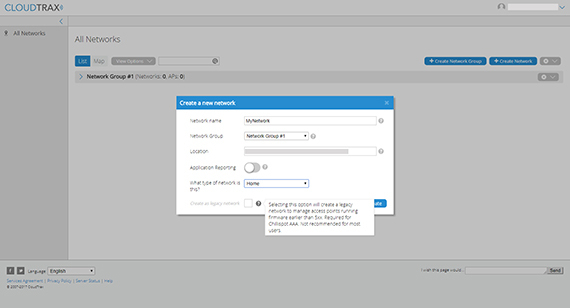 After you create your new Network, you can add the new switch by going to Manage, choosing Switches, selecting Add New (from the top right corner) and, when prompted, insert the name of the switch, choose the model (in our case, it’s going to be OMS8), enter the MAC address (written on the rear side of the switch), enter the Description and, if you want no configuration from the cloud to be sent to the switch, enable Monitor Only. 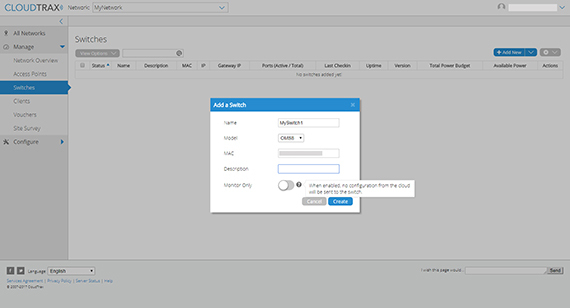 After you’ve added the switch, it will appear on the Switches page and, you can click on its name to view a graphical representation of the switch and do a more in-depth configuration. 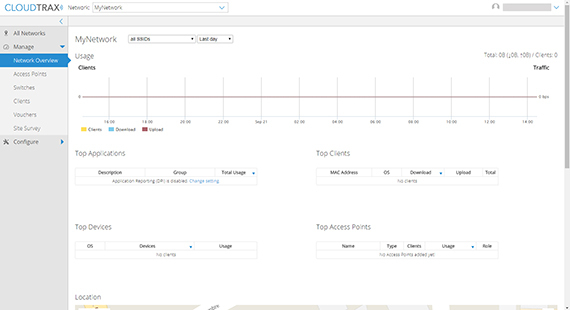 The Manage section also allows you to check the Network Overview (Usage – Clients and Traffic; Top Applications, which take advantage of the Presence Reporting API for gathering real-time data from your access points for third-party solutions or custom software – it will be part of a paid package in the future; Top Clients; Top Devices; Top Access Points and a Location Map) add and configure new Access Points, view a list of all the allowed and blocked Clients (filtered by SSIDs and by periods of time), create up to 2,000 Vouchers per network or 100 per access point (these vouchers are unique codes that you can provide to users – ideal for client connection in hotels, restaurants or coffee shops and can be set for a limited period of time, can have a download and upload limit and can be limited to a certain number of devices) and have a look at all the networks in the vicinity using the Site Survey (a great tool for finding out what channels your neighbours are using). Returning to the Switches section, if you click on the name of the switch you added, a new window will pop up which will show a graphic representation of the device itself (with the used ports being green – if you move the mouse over them, it will give you the option to remotely Reset the port, Disable the Link, Disable the PoE, see the number of devices on the Forwarding table and view the Port stats), on its right, there’s the MAC address, the Description, the IP address, the Management VLAN, the Total and Available PoE Power and, underneath, there are three main sections that can be visited: Ports, General and Tools. The Ports section will display a list of all the ports, each with its set of characteristics: such as the Allowed Tagged VLANs (Ingress and Egress), PVID, the Untagged VLANs, Voice VLAN (which carries voice traffic from IP phones over specific VLANs – be aware that the traffic does not get tagged automatically and it needs to be tagged by the client), Mirroring, Link Aggregation, Flow Control, Isolation, MAC ACL, IPv4 ACL, CoS (Ingress), Trust CoS (Egress), PoE Type (if left to Auto, the switch will prioritize the power to the port with the higher priority), PoE Priority (used with PoE Type, when it’s set to Manual) or Rate Limit (all these options can be changed by accessing View Options). 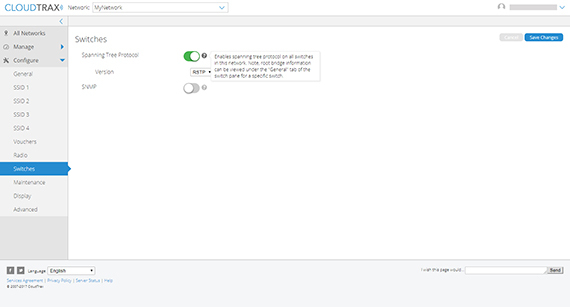 On top of the ports list, there are two options, one to Mirror a port and the other to set up two ports in link aggregation (to do so, simply select two ports and click Aggregate to create a new LAG Group – you can create up to four LAG groups at the same time, but be aware that PoE will be disabled and that the link aggregation is done using LACP, therefore you need a LACP capable device on the other end as well). 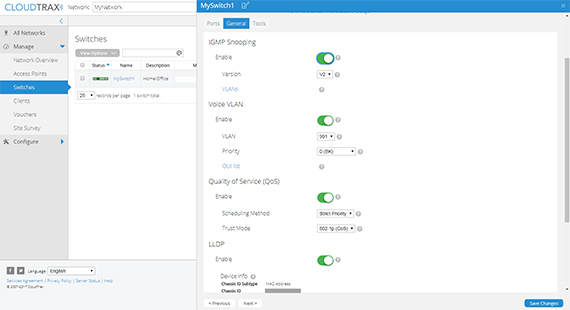 The General section gives you the option to enable the IGMP Snooping (select the version of the IGMP protocol and select the specific VLANs the IGMP Snooping should be applied to), the Voice VLAN (choose the VLAN to which to direct the traffic, set the priority of this traffic and, if necessary, edit the OUI list), the Quality of Service (choose the Scheduling Method – it can be Strict Priority or WRR – and choose the Trust Mode – can be 802.1p (CoS), DSCP or CoS + DSCP), the LLDP and view the STP Root Bridge info. 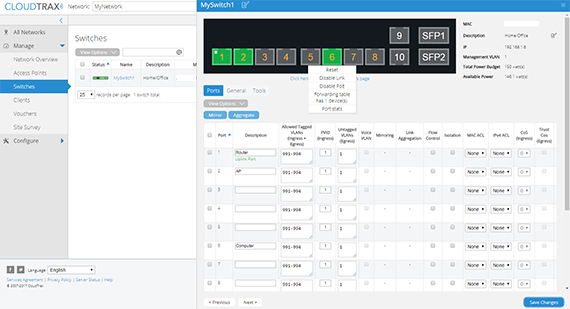 The Tool section allows you to run Cable Diagnostics on each of the ten Ethernet ports, view the LLDP Neighbours and perform Ping or Traceroute tests. 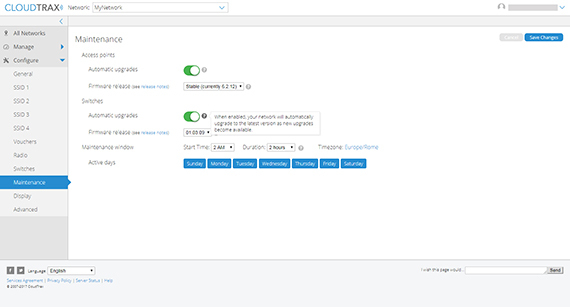 Afterwards, you can go to Configure > Switches to enable/disable the Spanning Tree Protocol (and choose the Version: RSTP, STP or MSTP), enable the SNMP, view and edit the Voice VLAN OUI list, edit the Quality of Service mappings (DSCP to switch queue mapping or CoS to Switch queue mapping) and edit the Access Control Lists (MAC Based or IPv4 Based ACL entries). The next zone of interest is in the Maintenance section, where you can enable Automatic upgrades and view the Firmware releases (an interesting feature is the possibility of reverting back to a previous firmware, in case the new one fails). CloudTrax is also available as an app for both Android and iOS, but, while it does seem to have almost all features (allows you to create or edit your already existing network), you can only view the connected devices or add new ones and nothing more (you can’t really make any other specific changes). Note: The switch is capable of supporting Jumbo frames, but CloudTrax has not yet implemented this functionality. 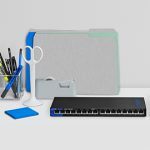 The Open Mesh S8 is a well-built Ethernet switch, offering both a good amount of PoE ports and a couple of SFP ports for high-speed networking, but the main feature that sets it apart from the other Layer 2 switches is, obviously, the CloudTrax integration, which is capable of delivering an incredibly simple configuration process from anywhere in the world, with an easy to navigate interface (you never feel lost and everything is where you expect it to be) and, most importantly, it’s free (but you are bound to the longevity of the company). 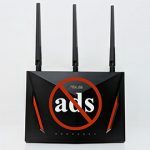 By releasing this series of switches, it’s clear that Open Mesh is focusing towards creating a complete solution for small to medium businesses and the last piece of puzzle seems to be a gateway/router. In the meantime, the S8 is a reliable switch to be used with the Open Mesh access points (that’s pretty much its raison d’être), but it will also work with almost any other PoE device (24-volt PoE devices are not supported) and will collaborate with switches from another brand. Furthermore, taking into account the features to price ratio, the S8 is definitely one of the most attractive solutions you can find right now on the market.